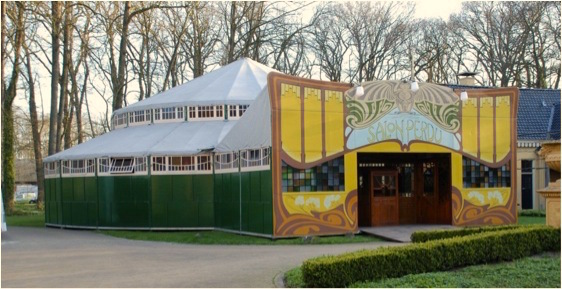 Spiegeltents or Mirror Tents, were originally built in Belgium between 1910 and 1922. These gorgeous round wooden structures toured central Europe for many years and were used for cabaret, theatre, parties, weddings and all types of musical events. Sadly the ravages of time took their toll and many of these fine structures disappeared completely. However today, almost a century later, these spiegeltent designs have been lovingly recreated and adapted to suit modern health and safety requirements. Mirror Tents are once again available for a variety of events. 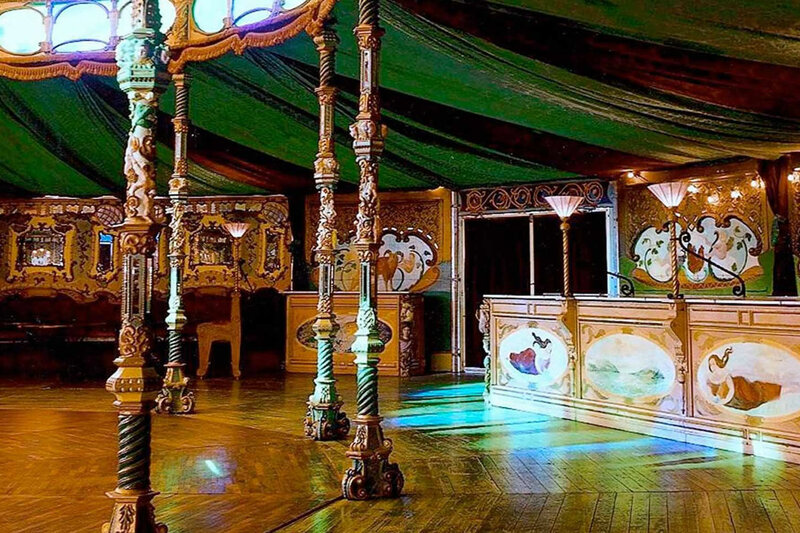 Both the Idolize and Salon Perdu spiegeltents have a circular wooden floor surrounded by cosy booths decorated with polished mirrors, leadlight windows and carved wood detail. They have a small stage, integral bar, elaborate entranceway and rich fabric drapes. 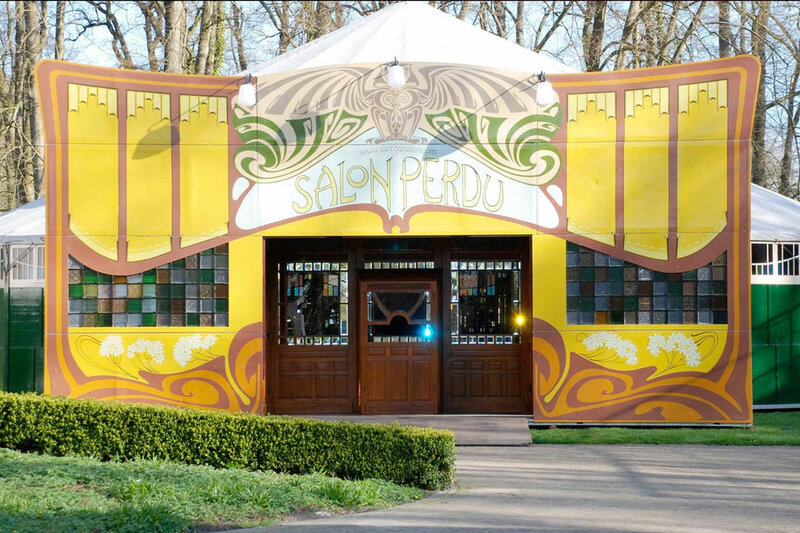 The Salon Perdu is a superb Art Nouveau style spiegeltent thats has a classy oak atmosphere, combined with dark red velvet and golden interior. Floor area has a size of 20m x 24m. The Salon is perfectly suited for festivals and big shows due to its capacity, but still by using its mirrors and many pillars, it remains cozy at smaller events. 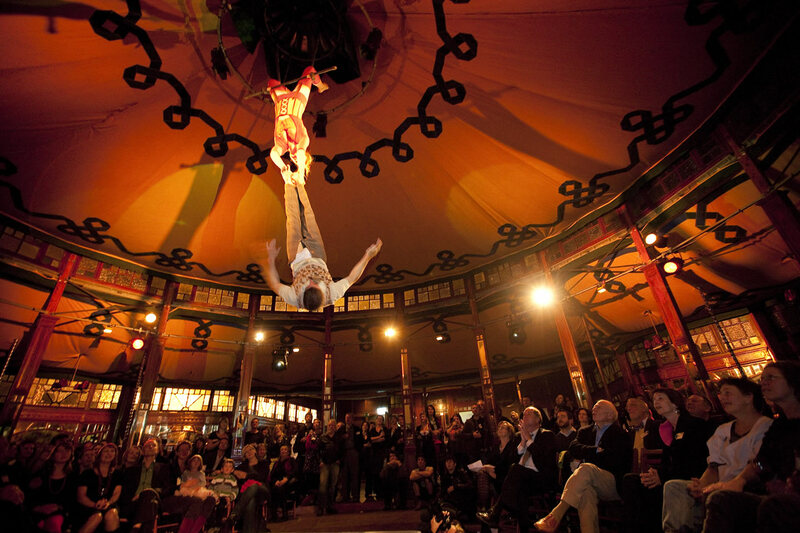 The story of the Idolize spiegeltent is one filled with love and passion. Two artists in love created a spiegeltent, immediately being their greatest piece of art. Nowadays she travels the world, and keeps on amazing people. It is all a matter of taste, but this spiegeltents keeps being fascinating for hours. Imagine your event in a surrounding that is this beautiful. 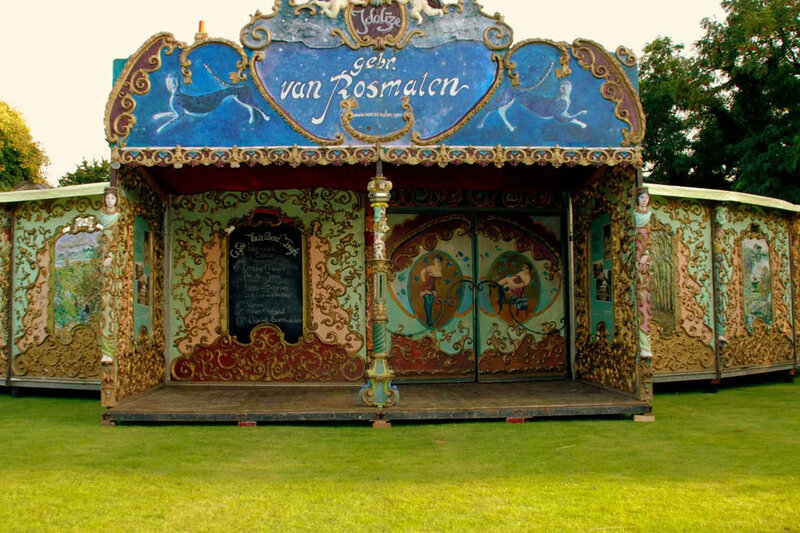 Spiegeltents are well proven structures that are simple to erect and dismantle. However, there are some basic requirements that you should be aware of before proceeding with an enquiry. 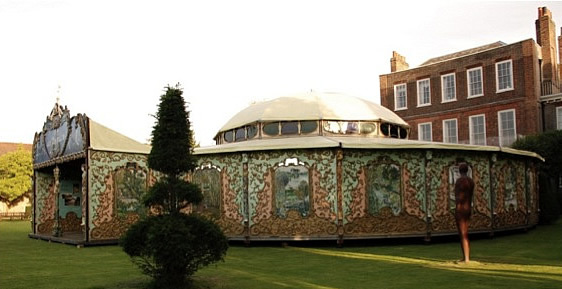 In normal circumstances spiegeltents can be erected in one to two days and dismantled in one. They are free standing structures and can be erected on tarmac, concrete, lawns and any firm surface. They cannot be erected on soft or wet ground. There should be sufficient space to allow for the footprint of the structure and adequate external access for fire safety requirements. In normal circumstances a clear open space of no less than 24m diameter will be needed. The ground on which they are erected needs to be flat, however a slight incline – a slope of 30cm over 20m - can be accommodated. Erecting a spiegeltent is labour intensive. It is delivered in an articulated truck. The truck needs to unload within 2 metres of the erection site. If truck access is not possible further labour charges will be incurred. The truck measures 16m in length, 2.55m in width, 4m in height and weighs up to 35 tons. 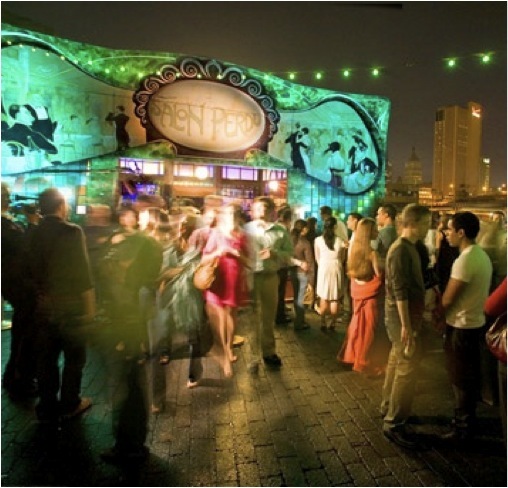 Spiegeltents are supplied with period internal lighting. The Hirer must supply a 32 amp 3 phase RCD/RCB protected power supply. You would be responsible for connecting and testing supply. 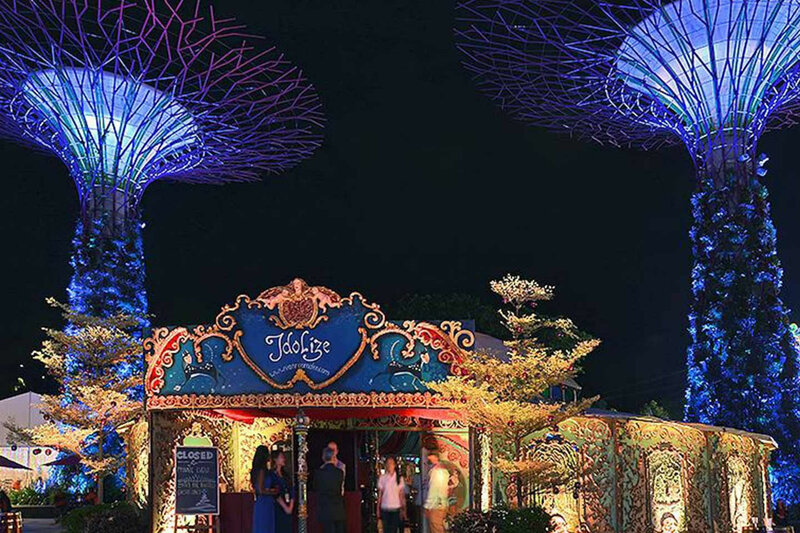 Spiegeltents are not supplied with emergency house lighting, fire exit signs, fire extinguishers, disabled access ramps or steps to entrances if the slope of ground requires the provision of higher steps. Spiegeltents are supplied with a bar for serving drinks. These bars do not have sinks, water supplies, waste systems or coolers. We will be happy to undertake a site visit and will advise the client on all aspects of installation, capacity, seating arrangements, staging and maintenance of the structure. Please be aware that capacity figures are advisory only. It is the Hirers responsibility to ascertain and regulate fire capacity after consultation with local fire officers or safety representatives. We are the UK agent for the owners and supplier of the Spiegeltents based in Europe. 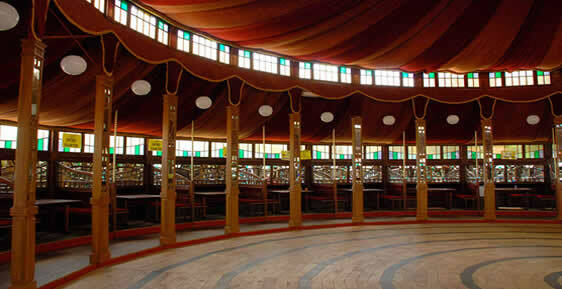 Spiegeltents or magic mirrors, were orignially built in Belgium in the early 20th century. They were the great fairground attraction at that time. Thousands flocked to their beautiful oak dance floors, or sat in the elegant booths for a drink, a snack, or a romantic tête-à-tête. 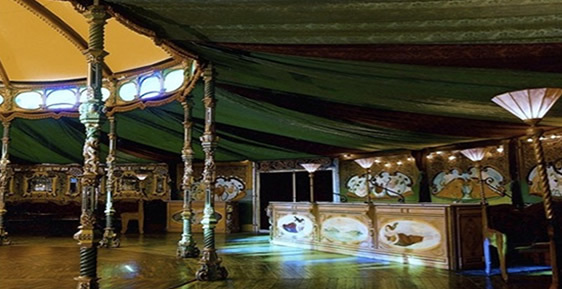 Each spiegeltent creates a romantic and truly enchanting ambience and provides a genuinely unique setting for your guests – whatever the event. Most of the tents incorporate an integral bar, small stage and box office/ ticket booth at the entrance. These tents can be erected in a day or two by an experienced and friendly team – all that is required is a flat, firm, unobstructed area measuring about 30m x 25m, with access for an articulated truck. 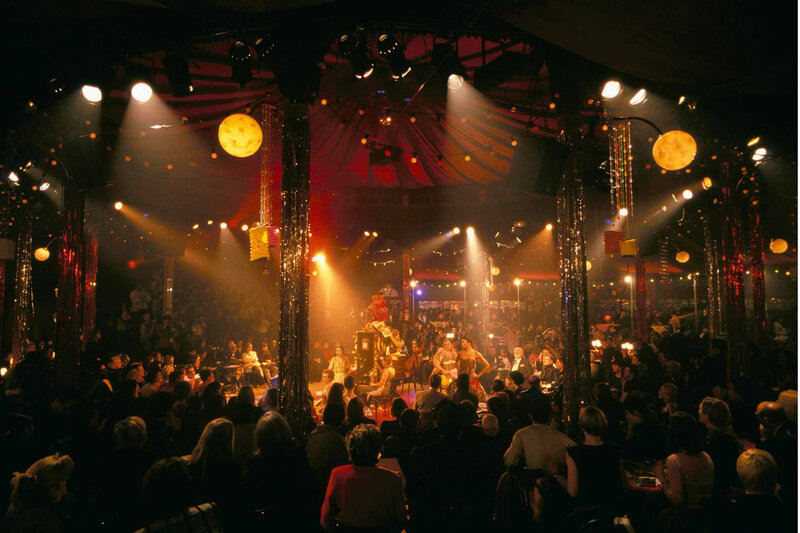 A spiegeltent is built mostly of hardwood with a canvas roof construction.